Kitchen is my haven where I feel most relaxed and happy. It is the place where most food experiments happen and where despite the type of the day I have had, my mind is taken away from all my life’s worries. Being a foodie and a cooking enthusiast, I am always visualizing my ideal kitchen- a place that I will design myself to have everything in it right from the gleaming counter tops I have often seen on famous cookery shows to the state of the art appliances I have often drooled over while window shopping in malls. One day very soon, I vow to upgrade it and go all out to get my dream kitchen. I have been researching and visualizing my dream kitchen in my mind for as long as I can remember and from all the various styles, I just love the Eclectic Style Kitchen which allows to have an array of distinguishing features to help us in designing a visually interesting cooking and dining space. With a moderately spaced house like mine, I want my kitchen to look spacious and be able to make clever use of the available space like in this kitchen I just loved! This lovely eclectic style cooking space has all the features that I covet in my future kitchen. With its modern look and the perfect combination of timber wood, steel and glass used in the counters, appliances/fixtures and cabinets, this kitchen design has its own unique feel and a very classy look. Just look at the ingenious use of the space under the stairs where shelves have been added to keep all my cook books and any other stuff I want like crockery etc. A small fridge is also added in the lower section! The super shiny upper cabinets look like mirrors on the outside but are in fact cleverly disguised cabinets that don’t look odd and beautifully complement the ultra-suave look of the kitchen. 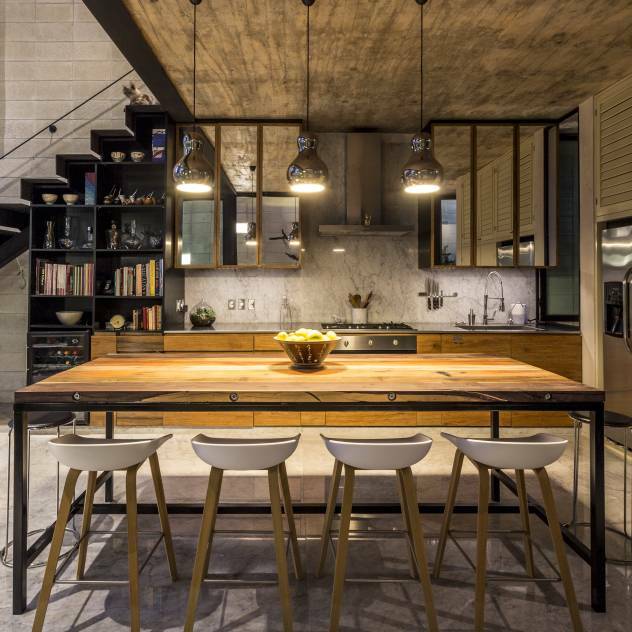 The modern hanging lights with the slightly rustic looking sitting table below and the whole décor of this kitchen and dining space expertly meshes with the drawing room without making it look odd and is just too good. No kitchen is complete without really great appliances to go in it and this kitchen design has included a stainless steel double door fridge with an ice machine so easily in such a small space. The oven/grill can be so inconspicuously included below the counters amidst the wooden cabinets and will be so ideally placed that I can’t help feeling impressed. With my sleek induction top, I can just visualize the eye catching beauty of my future kitchen! There are so many possibilities of freely applying my creativity in placing my appliances in this kitchen. The lovely mix and match here with its rustic and modern combination of items has me itching to make my cooking space just like this one. There are just so many things I adore here. So with this eclectic style kitchen design in my mind, I just can’t wait to go all out and get the kitchen I have always dreamed about! What do you think of my dream kitchen pick? Does this one call your name? What are your dreams about your ideal kitchen?